EXCLUSIVE: Kobato. TV Anime announced !!! From the preview of the next Newtype cover comes the official announcement: Kobato. will be made into a TV anime !!! That’s all information available at the moment. I know it feels like we don’t have enough material for a TV series, but we don’t know when it’s going to premiere (isn’t next Spring too soon?). Apart from that, you all remember CCS and how its many original episodes contributed a lot for its success, maybe the same thing could happen with Kobato.? A HUGE thanks to radiomacrossing for telling me about this! I hope Maaya Sakamoto lands the role of Kobato-chan! YUI singing for the OP would be lovely 🙂 I think her voice would suit the style and mood for Kobato..
I’m also really curious about the time slot, we all know that Kobato. as a series have lots of secrets (possibly dark ones), it might seem like a kiddy series now but we never know. I just hope it doesn’t follow TRC’s path, having it at the prime time slot and then when the series really hits its high point (ANGST ANGST ANGST), the producers will have to fill it up with fillers then ruin the flow of the anime. Good point. I hope CLAMP has learned the lesson. They should be clear with the producers about what they have in store for Kobato. I can’t help but keep wondering about the cast, I think Ono Daisuke would do a good job for Fujimoto. I don’t think it’d really be “ready” for next April, but I think Spring would would a good season for it to start. But I agree that Kobato. HAS TO start in the Spring. So if it doesn’t start in 2009, then only in 2010? Newtype has to provide more pages for CLAMP to draw bigger chapters! With only 14 pages per chapter we won’t get any more than one volume a year. I think if internet fandom had been at this level when CCS was airing, all the analysis and week-by-week commenting on each episode (with everyone having read the manga already) would have resulted in a lot of people hating the CCS anime for its insane overabundance of filler. Don’t get me wrong, I love the CCS anime. I’m just sayin’ is all. >I think if internet fandom had been at this level when CCS was airing, all the analysis and week-by-week commenting on each episode (with everyone having read the manga already) would have resulted in a lot of people hating the CCS anime for its insane overabundance of filler. You know I ALWAYS wondered that? If we would accept it so easily having read the manga before. I know most people didn’t read the manga before watching the anime. I guess we’ll never find that out. Yeah, me too. I saw the anime first, so I didn’t really think about what parts were anime-original until I finally read the manga a couple of years later. Very different to my perspective on Chobits and Tsubasa. Well in my case, as long as these original episodes (or most of them) are written by Ohkawa, or at the very least approved by her (that is, if she’s working in the staff), I’m okay with all the infinite amounts of original episodes like CCS. i know it, since ohwaka talks about the yoga teacher´s voice!!! I’ll cry if they dumb it down, ajdsdfldsg. YES! I’m tired of so-so CLAMP anime adaptations. It’s going to be hard if it’s premiering next Spring and Newtype doesn’t allow CLAMP to draw more than 14 pages per chapter. I really hope they’ll revive the “dream team” again, that is CLAMP (Ohkawa and Mokona) x Madhouse. It worked so well in CCS! It’s worth the keyboard smashing ♥ sweet dreams! HASGNHANSGVSK!!! ;A; I LOVE YOU CLAMP! I’MA EFFIN WUV YOU!!! Oh wow! &hearts! I hope it’s a good anime, Kobato. certainly deserves it. What the bleepery?!? Aw man, I am not having high hopes for this… but at least there will be more color references for cosplay! OH GOD!!!!!!!!!! Thanks Chibiyuuto this made my day!!!!!!! **Fingers crossed for Ohkawa being part of the stuff >. is too soon but maybe anime is next autum??? I don’t really care which studio animates it though, preferably Madhouse as long as its not Beetrain, then its fine by me. OMG OMG OMG OMG OMG OMG OMG!!!!! I’ll see the hot debt collector-san animated!! That’s so cool! Kobato. in Anime! Despite my niggling concerns (not enough content being number one) I can’t help but be excited! I LOVE Kobato! Oh, I can’t wait! Here’s hoping this will encourage Newtype to devote some more pages to Kobato. And for an English Language publisher to license the volumes (since Newtype USA doesn’t print anymore). I’m buying the tankobans, but I want it in English, too. I guess that if Ohkawa goes onto staff that they might not have time to immediately pick up another manga *cough*GD*cough* after Tsubasa/HOLiC ends? They’ll still be doing Kobato and they’ll have the mangettes to do, too. I think Tsubasa and HOLiC are drawing to a close, but they had trouble doing the CCS manga alongside assisting the production of the CCS anime. I can’t imagine them assisting the Kobato anime AND doing the Kobato manga AND doing the mangettes AND doing another manga on top (even if 14 pages of Kobato a month must be relatively simple). And that’s assuming that TRC/HOLiC ends before the anime production starts. CLAMP are going to be busy ladies, no matter how it all works out. 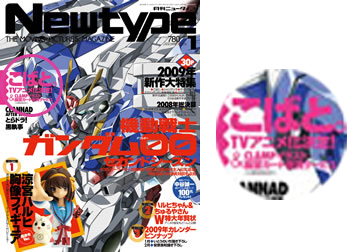 >Here’s hoping this will encourage Newtype to devote some more pages to Kobato. Same here. Please. It’s an urgent need now. I think they can handle one more manga. Gouhou Drug, for example, with Nekoi as the main artist, she’ll be free after XXXHOLiC ends. Mokona handling Kobato.’s main art and, lets suppose, Mangettes’ main art. And Nekoi handling GD’s main art. Oh awesome! I need my clamp anime fix. I wonder who will do the voices. Yay for having things to watch next year.